It was more than a month ago when OnLive the last time released a game with Intrusion 2 joining the PlayPack, recently they've made more headlines by removing games. Now OnLive again released a game as WRC 3: FIA World Rally Championship joined the PlayPack. This is very surprising as the game was released for other platforms just a few days ago, and even more surprising is the fact that the game wasn't released as a PlayPass, but instead got added to the OnLive PlayPack, which is now at 249 games in the US, 248 games in the UK and 248 games in Belgium, and counting. OnLive senior manager of customer relations Nathan Barsetti wrote at OnLive Fans, "I've been anxiously awaiting the release of this game, as I absolutely love Rally. I kind of feel like it was a missed calling of mine. I guess it's never too late. Anyone feel like being my title sponsor? But I digress... This new title, launched on PC on 10/12/12, is now available on OnLive only in the PlayPack! This is a single player title, and we'd love to hear from people about their experience using racing wheels. If you have an XBox compatible racing wheel or a Logitech G27 or Logitech GT wheel, we'd love for you to give it a spin. I'm not necessarily saying it will work, but we'd like to hear about it. You can submit a feedback ticket or post here, I'll keep an eye on the thread." Looks like OnLive wants to expand their control options and is looking for test bunnies, so if anyone wants to test the game with a racing wheel he can share his experience with it in this OnLive Fans thread or submit his feedback to OnLive. WRC 3: FIA World Rally Championship is a racing simulation game published by Plug in Digital and developed by Milestone. Looks like Milestone is quite supportive of OnLive lately, as they've already released another racer on OnLive at the end of August, that racer also has an official license, but is on two wheels. The name of the game is MUD - FIM Motocross World Championship. With Codemasters saying that they won't support OnLive anymore because they'll focus on their own online platform, it would be great if Milestone would bring more of their solid racing titles over to OnLive. 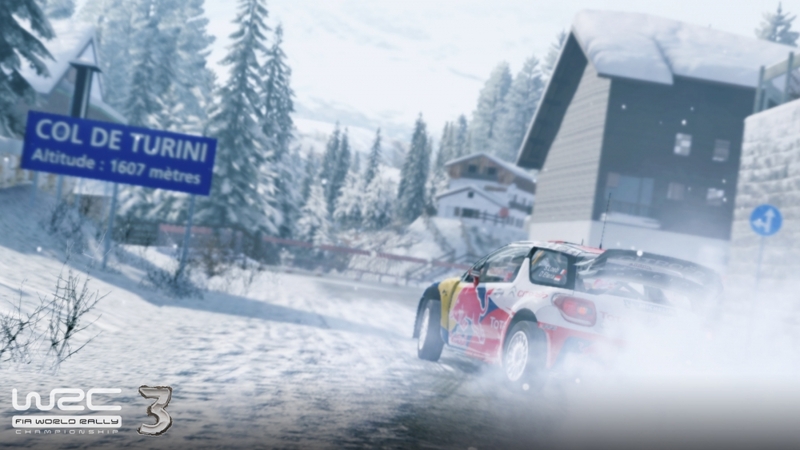 As mentioned previously, WRC 3: FIA World Rally Championship bears an official license. Gamers can enjoy all the official contents from the 2012 FIA World Rally Championship in the game, including all the main teams, cars, locations and a lot of exclusive contents, like the Rallye Monte-Carlo and Volkswagen Polo R WRC test car! In WRC 3 all the graphics aspects have been completely reworked to give the player the best experience in a rally game. Thanks to the new Spike Engine, new lighting effects, shadows and particle effects are featured in the game to offer the maximum level of realism to each player. And pay attention to the new surfaces and the weather conditions! The brand new career mode is the largest and most fun section of WRC 3. It is a mix of racing gameplay and management elements where the player customizes cars and the team, increasing the sense of replayability, mixing all with a common narrative thread and an adventure around the world! The career mode also comes with a brand new challenge system in which players will face different challenges based on hitting targets or performing particular special manoeuvres! The new game engine allows a different management of in game sounds and effects. All the cars have also been recorded live with on board microphones to catch all the real effects heard by the drivers. For each EFIGS country a professional actor has been appointed to perform pacenotes given by a real co-driver to guarantee a real on board environment to the player. The game includes an accurate and revamped physics model allowing players to feel the same emotions of a driver racing a real WRC car. Although car behavior on the track is really close to reality and gives experienced users a very satisfying feeling, WRC 3 offers a set of driving helps (auto-brake, auto-transmission, braking assistance, stability help and physical damage level) that allow beginners to perform complete rally races with special stages included and enjoy the game without too many difficulties. You can play the free demo of WRC 3: FIA World Rally Championship for the US, the UK and Belgium powered by OnLive.